Mastering the public transport in big cities can be tough, especially when you’re not prepared. But with our Getting Around Guides, we can guarantee that you’ll be getting around like a local in no time at all. We have spent nearly our whole lives getting around on public transport in Sydney. And as much as the locals (us included) like to complain about it, it’s improved greatly over the last few years. Yes there are still many black spots throughout the suburbs that are poorly connected or where there aren’t enough services to accommodate the population. But for someone visiting for just a few days to see the major sights, getting around Sydney is simple with everything well connected and the system easy to use. 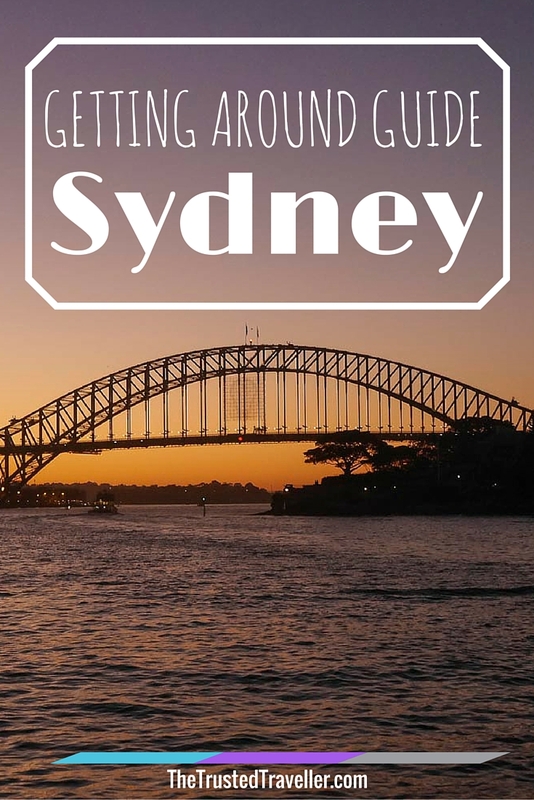 This getting around Sydney guide aims to help you hit the ground running when you arrive and assist you to maximise your enjoyment of this beautiful city. 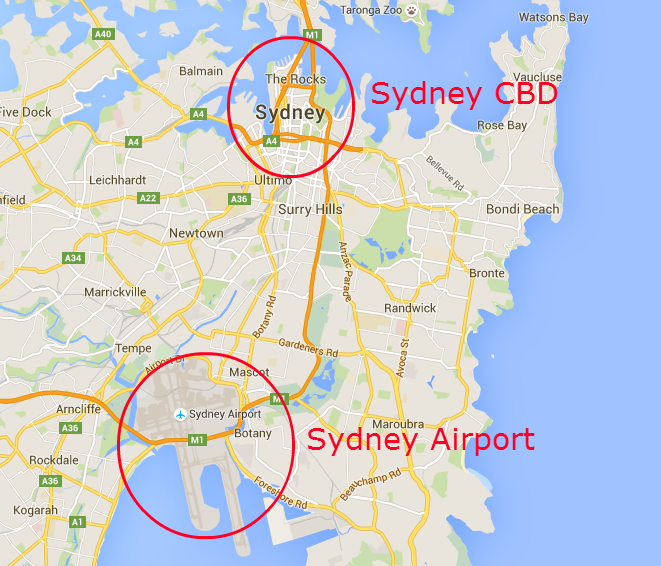 For now Sydney has just one major airport that takes care of all domestic and international arrivals and departures. There has been plenty of talk over the last few years about constructing a second major airport in Western Sydney to alleviate the pressure on Sydney Kingsford-Smith, but it is unlikely to be in operation until the mid 2020s. Sydney Kingsford Smith Airport is located just 8 km south of the city centre making it one of the most centrally located airports in the world. 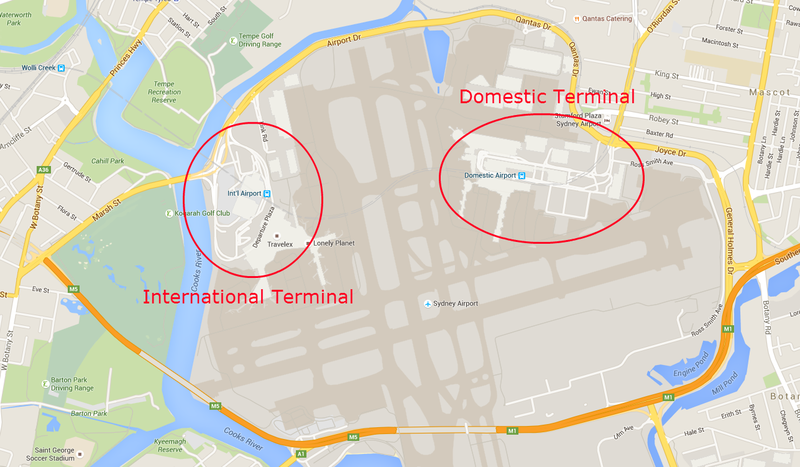 Sydney Airport has three terminals, two for domestic and one for international. The international terminal (T1) services flights to/from all over the world. The domestic terminal is split into two with terminal T2 taking care of Virgin Australia, Jetstar, Tiger Air and various regional airlines domestic flights, while terminal T3 takes care of Qantas domestic flights only. Sydney Airport is very well connected to public transport and because of it’s close proximity to the city centre, it’s quick and easy for visitors to get to/from their accommodation without too much trouble. The T2 (Green) Airport train line runs right under the airport with stops at both the Domestic and International Terminal. This line runs directly into the city and to the south western suburbs as well as intersecting with most other major train lines around the city. Travel time to Central Station, right in the heart of the city, takes 14 minutes from the International Terminal and 11 minutes from the Domestic Terminal. Services run every eight minutes in peak times, less frequent in the late evening, weekends and on public holidays. This same train line also continues onto the stations that run around the City Circle such as Museum, St James, Circular Quay, Wynyard and Town Hall. From all of these stations you will find simple connections to other train lines, buses and ferries to take you to just about anywhere in the city and surrounding areas. Sydney has a standardised ticket pricing system for all forms of transport which I outline in more detail in the Tickets section further down. The only exception to the standard pricing is the Domestic and International train stations. If you take a train or alight from either stops you will be charged a station access fee of $AU13.00 for adults and $AU11.60 for Senior/Pensioner, Concession and Child/Youth on top of the standard fare. Check out the AirportLink website for more information. Sydney Buses operates one route, bus number 400, between Bondi Junction and Burwood which stops at both the International (T1) and Domestic (T3) terminals. You will find the clearly marked bus stops located on the arrivals level outside each of these terminals. Ticket prices are included in the standardised ticket pricing system which you will find more information about in the Tickets section further down. 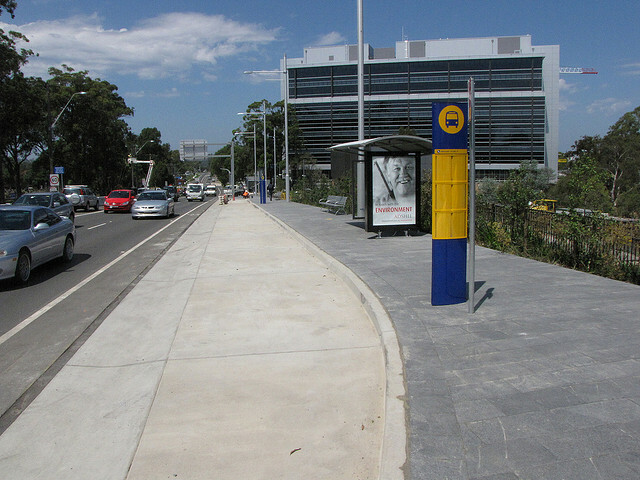 Check out Sydney Buses website for more information on this bus route. For door to door shuttle transfers to/from your accommodation head to the ground transport travel desks located at both International T1 and Domestic T2 arrival areas. Shuttle prices start from $AU22.00 per person for a ride from the airport to the CBD. Alternatively, if you wish to pre-book a shuttle transfer check out Redy2Go for a quote and to make a booking. All three terminals have dedicated taxi ranks right outside the arrivals area. 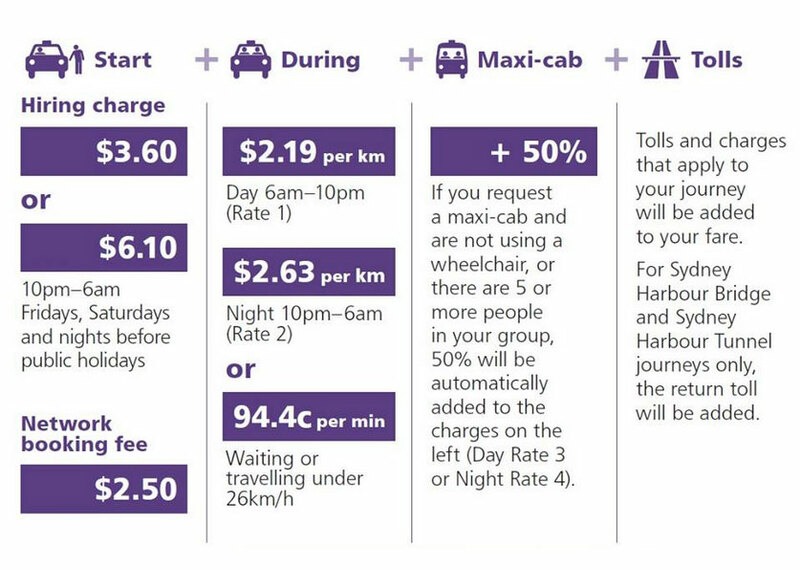 A one-way taxi fare to the city centre will cost around $AU50.00 including the $AU4.10 airport toll. 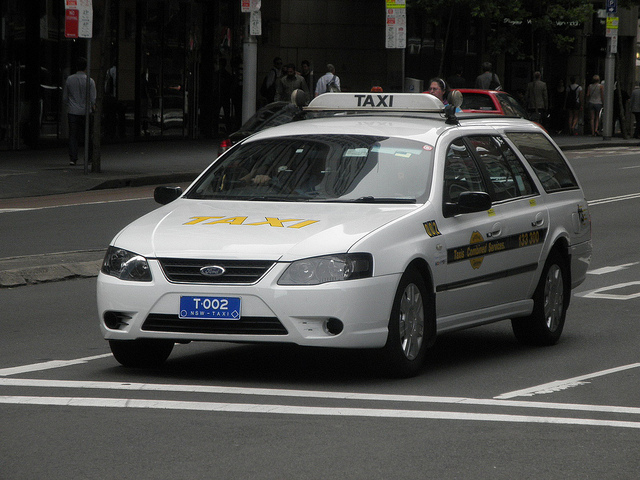 More details about taking taxi’s in Sydney can be found further down. If you live in another part of Australia or have arrived from overseas into another Australian city, then you may also choose to arrive by bus or train. 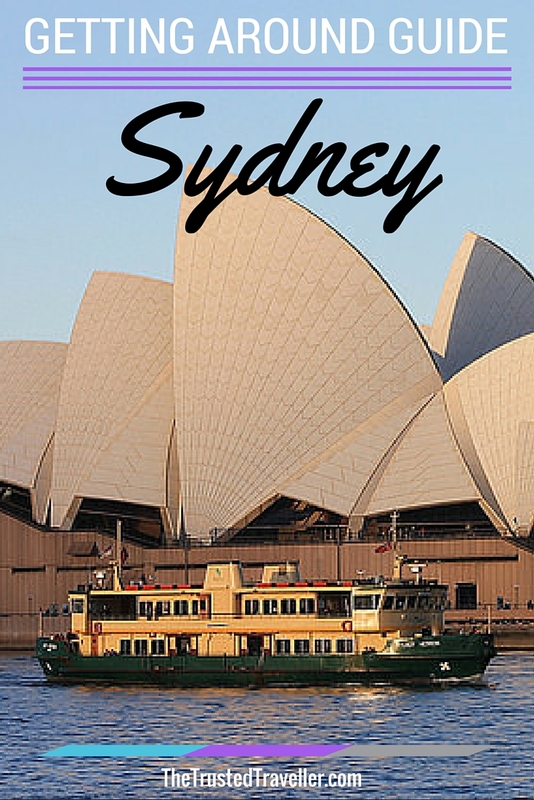 Sydney has one major bus terminal located at Central which is right in the heart of the city. Most services will also make a stop at the International Terminal to collect arriving passengers who are travelling outside of Sydney. Central Coach Terminal is well connected to Central train station, local bus services, the Light Rail and there is a taxi rank nearby making it easy for you to get to your accommodation. There is also a travel information office at the terminal if you need assistance or advise about getting to your accommodation or booking onward travel. Murrays Coaches – Services to/from Canberra, Wollongong and the Snowy Mountains. Greyhound – Services to/from Canberra, New South Wales North Coast, Mid North Western New South Wales, Snowy Mountains, Toowomba and Brisbane. Both of these companies have offices you can drop into at Central Coach Terminal. For those backpacking around Australia there is also the OzExperience bus which runs along the coast form Melbourne to Cairns including Sydney. Australia isn’t known for its rail system with very limited services that are slow and expensive when compared to other parts of the world. However if train travel is what you like then there are definitely services you can take to Sydney from other parts of the country. 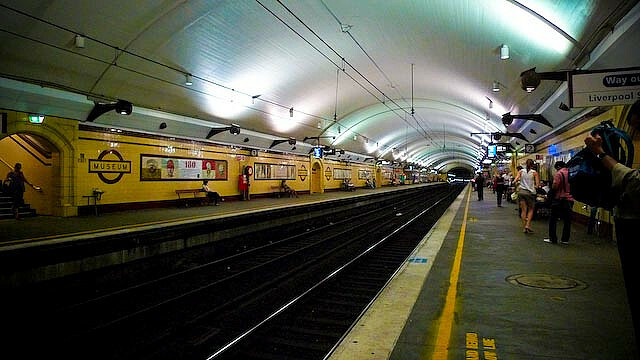 Like the buses, all intercity and interstate trains arrive and terminate at Central where you will find connections to most areas of Sydney via local trains, buses, the Light Rail and taxis. Trains to Sydney come from Brisbane, Moree, Armidale, Dubbo, Broken Hill, Griffith, Canberra and Melbourne, with lots of stops inbetween. Bare in mind that Australia is a very big country so travel time from some of these places can up to 15 hours. Check out the NSW TrainLink website for more information on train travel to Sydney. Sydney’s public transport system consists of trains, buses, a light rail (similar to a tram) and ferries. All are operated by Transport NSW. A great app I recommend for visitors and one that I use daily is TripViewLite. It lets you input the details of where you want to go from and to and calculates the best route giving you step by step directions. Download it here for FREE. From January 1st 2016 Sydney will officially become paperless with all paper tickets being abolished following the trends of many other big cities around the world. In the place of paper tickets is a plastic card called an Opal Card. This electronic card is free to obtain and can be picked up from and loaded with money at Opal.com.au, train stations and Opal Retailers. It is a pay-as-you-go system that deducts the fare at the end of your journey. To use the Opal card on all public transport simply tap your card on the round Opal Card reader when you enter a train station, board a bus, before boarding a ferry or on the light rail platform. When you finish your journey simply do the same thing, tapping off and allowing the system to calculate the correct fare. If you are transferring from one mode of transport to another you are still required to tap on and off on each mode. If you transfer within 60 minutes your journey is continued and fares are calculated accordingly. For all public transport, fares are calculated based on the distance travelled and there are different tiers for each mode of transport. Most of the travel you would do as a visitor would likely be travelling less than 10 km unless you take a day trip. The tables below show the fares for each mode of transport. All fares on Sunday at capped to $AU2.50 all day. Seniors/Pensioners are capped at $AU2.50 all day everyday. Daily travel is capped at $AU15.00per day. Travel eight journey’s in a seven day period and travel for the rest of the week is FREE. A week begins on Monday and ends Sunday. Weekly travel is capped at $AU60.00 per week. 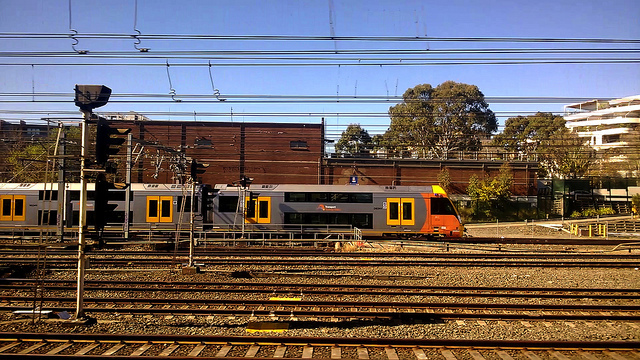 Sydney Trains consists of eight colour coded and numbered train lines that intersect and lead to the city. Here is a link to the official Sydney Trains Network Map to help you get familiar with the network. Most visitors will mostly use the T2 line to get to/from the airport and around the City Circle; the T3 line for the City Circle; and maybe the T1 line to get over to North Sydney and the T4 line for Bondi Junction. During peak times trains can run every few minutes from some stations and outside of peak around every 10-20 minutes depending on the station. Most trains stop running around 12-1am and start up again around 4am. If you miss the last train or need to travel outside of these hours you’ll find Nightride buses that run on the same route as the train leaving from street level near the train station. 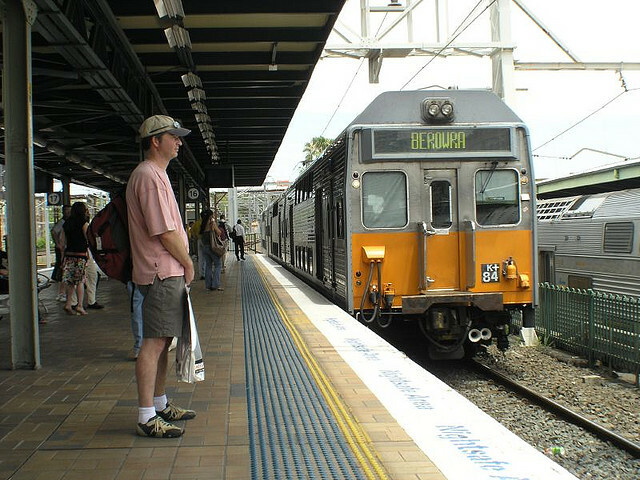 Here are some tips on using trains in Sydney. Enter the station through the concourse area where you will find machines to top up the credit on your Opal Card (some stations have ticket windows too) and digital display screens showing what trains are due next and which platform you should go to. Tap your Opal on the round card readers to access the platforms. 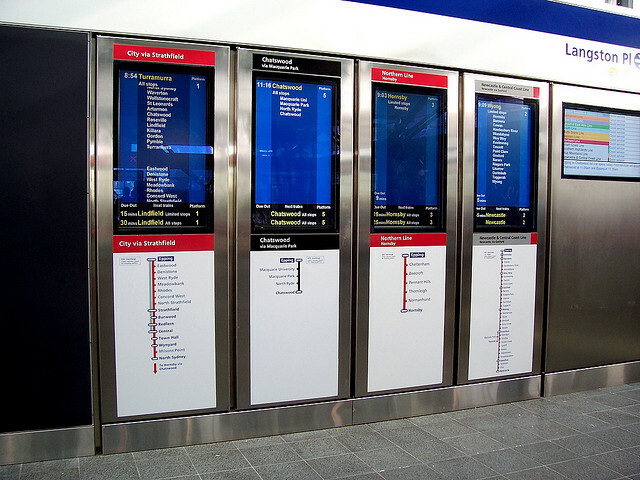 On the platform you’ll find digital display screens that show the stopping pattern of the next train as well as the final destination of the next two trains. It will also tell you the numbers of minutes until the next train arrives. When the train arrives you wait for the other passengers to alight before boarding. Once the train arrives at your station, you alight, head to the exit and tap out with your Opal. Some larger stations have posters on the platform that will tell you which exit you need for where you want to go. And if at any time you need assistance, most stations will have at least one station attendant who can assist you. Sydney has a few hundred different bus routes and you’ll find no matter where you are in the city or suburbs that your not far from a bus stop. Because the network is so big, there isn’t one bus route map, however the Sydney Buses website has a route planner and individual maps for each route. 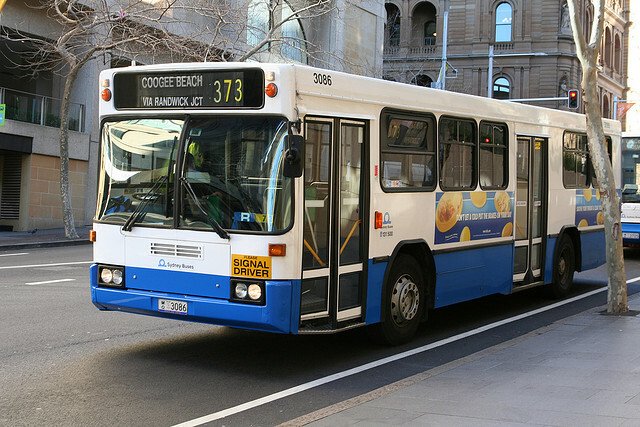 Here are some tips on using buses in Sydney. Most bus stops, especially the ones in the city centre are distinguished by the tall yellow and navy blue signs that show an image of a bus. On those signs you will find information about the buses that stop there and sometimes a timetable and/or route map. An approaching bus will have the bus number and final destination clearly showing on the front of the bus above the front window. To get a bus to stop you must flag it down put clearly putting your arm out to signal the driver you would like to board. 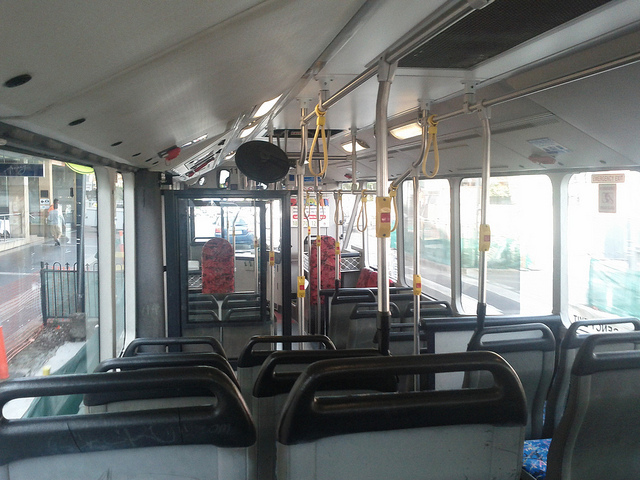 Board the bus through the front door and tap your Opal card on the round card reader and take a seat. Unfortunately the stops are not announced and there is no display or map on the bus telling you when you need to get off. I suggest you know approximately how many stops you need to go before boarding or let the driver know where you are getting off and they may be able to alert you of the stop. When your stop is approaching, press the red stop button which you will find on about every second pole. Make sure you allow plenty of time for the bus to safely stop. Alight from the bus from the back door, or front if there isn’t any passengers waiting to board, and tap off your Opal Card to end your journey. Depending on the route, some buses in Sydney will run 24 hours a day while others will stop in the later evening and start up again early in the morning. Sydney has seven different ferry routes that crisscross the harbour and head up the Parramatta river, all of which start and finish at Circular Quay. Here is a link to the official Sydney Ferries Network Map to help you get familiar with the network. Most ferry routes run from about 6am to 11pm with services every 10-15 minutes in peak times and about every 30-60 minutes outside of peak times. It is important to note that some ferries are faster than others due to the type of boat and number of stops it makes. 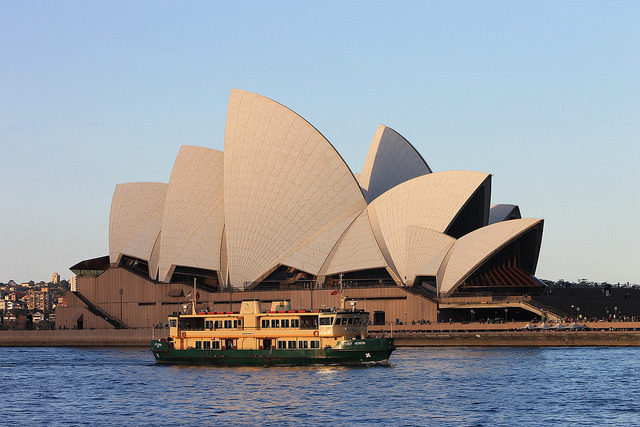 Here are some tips on using the ferries in Sydney. 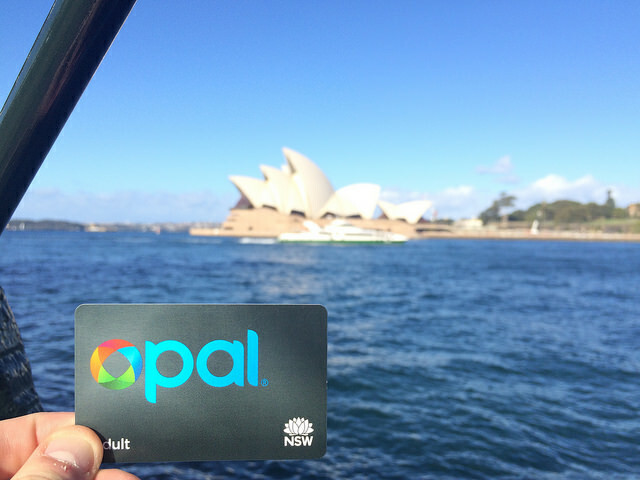 Tap your Opal Card on the round card reader before boarding the ferry to start your journey. 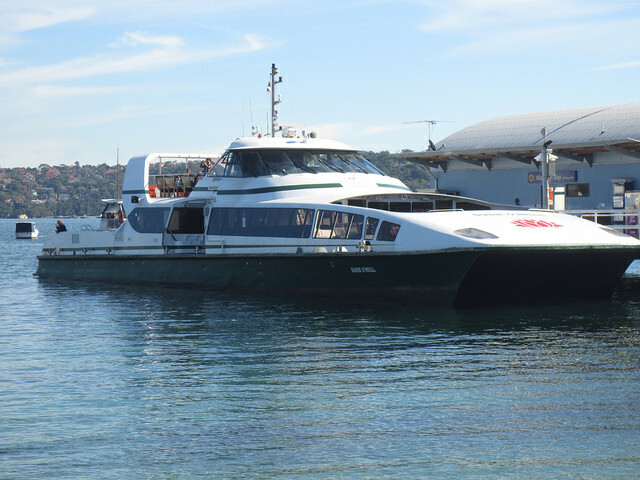 Once you are onboard feel free to roam around inside and out to take in the great views of Sydney Harbour. The ferry stops will be announced over the load speaker as the ferry approaches each stop. Make your way to the exit ready to alight. 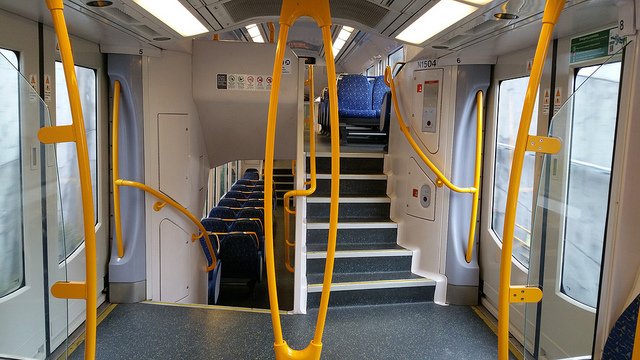 Once you have alighted, tap off your Opal Card to end your journey. Sydney has just one Light Rail line at this time which travels from Central to Dulwich Hill via Darling Harbour, Glebe and Leichardt. Here is a link to the official Sydney Light Rail Network Map to help you get familiar with the network. The Light Rail operates from 6am to 11pm with services every 10 minutes during peak times and every 15-25 minutes outside of peak times. Here are some tips on using the Light Rail. The Light Rail will stop at every stop so there is no need to signal the driver. 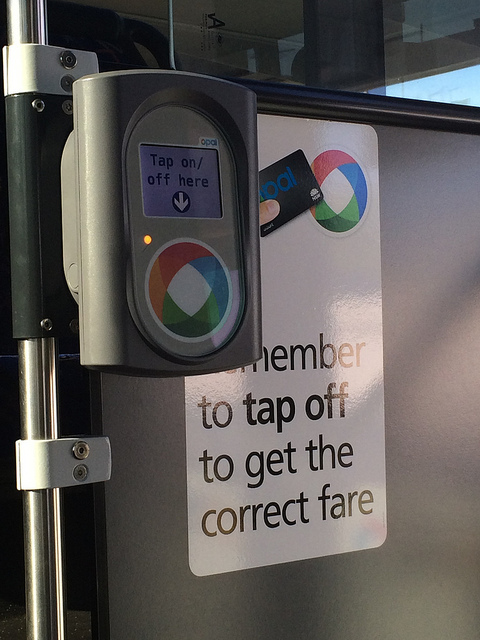 Tap your Opal Card on the round card reader before boarding the Light Rail to start your journey. There is a ticket inspector on all Light Rail services who will check you have correctly tapped on your Opal Card. The next stop is clearly announced over the load speaker as you leave the last stop and as you approach the next stop. Once you have alights, tap off your Opal Card to end your journey. 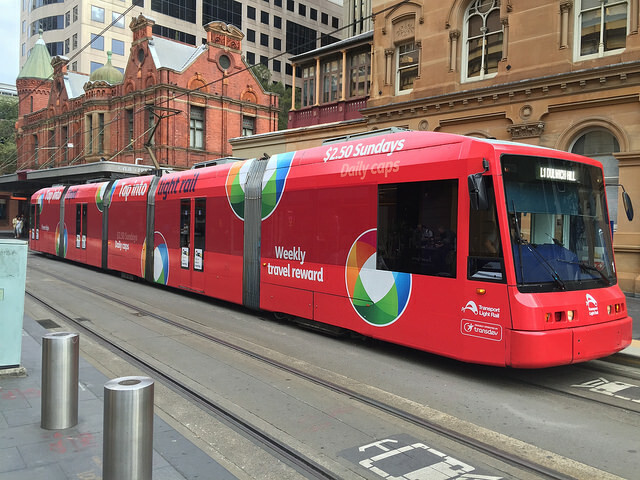 For more information on Sydney’s trains, buses, ferries and Light Rail including timetables, check out the Transport NSW website. There unfortunately isn’t just one taxi company in Sydney, rather there is almost 20 that service Sydney and the surrounding areas. However fares are standardised across the board. You will find taxi ranks outside all major hotels, near train stations and popular entertainment venues and in certain places around the city centre. Alternatively you can hail an oncoming taxi that has the light illuminated on the roof by putting out your arm to signal the driver. You can also call for a taxi to pick you up at a specific time and address. You accommodation will be able to provide you with the phone number for a taxi company or even book one for you. Fares are metered so make sure your driver has the meter on when you take off. The final fare can be paid by cash or credit card. Ensure that if you are paying in cash you have close to the right change as drivers do not carry a lot of change. Safety is always something you should think about when travelling on public transport anywhere in the world and Sydney is no exception. Sydney’s transport is one of the safest public transport systems in the world. However it is always important follow a few simple safety rules so you dream holiday doesn’t come to a terrible end sooner than you’d expected. Keep your personal belongings close to your body. Make sure you hold onto a pole or handrail at all times when standing in case of sudden stop. If there are seats available you will be safest sitting in them. If you are travelling at night on the train, travel in the guards carriage which is illuminated by a blue light either in the middle or front of the train. Keep well behind the yellow line on train platforms and watch out for oncoming buses and light rail while waiting at the stops. Hold children’s hands while waiting. While on train station platforms and trains, look out for the Emergency Help Point to contact the train guard or station attended if you feel threatened or unsafe. Alternatively, call 000 from your mobile phone for Police, Fire or Ambulance. I’d love to hear about your experiences using public transport in Sydney or your hometown!